Posted October 6, 2016 by sdrexler-admin & filed under Forged Documents. At Drexler Document Lab, we deal with many people’s concerns regarding the validity and authenticity of a range of documents, including examining the handwriting that can be found on any given document for signs of alteration of forgery. But that’s not all we do. We have an extensive list of services that can be of great help for criminal cases, disputes or general inquiries. Our ink differentiation and analysis service allows us to review a document to see if more than one kind of ink was used, possibly in an attempt to alter the document. Though it may be hard to see with the naked eye, our technology allows us to compare inks and carefully analyze the writing or signatures on a document to determine authenticity and to see if anything has been altered or changed. Just like different people have different fingerprints, check writing machines often have small defects in their operation which gives us the opportunity to identify the exact machine that produced a given check. With check writing machine identification, we can compare a specific check you may have to the manufacturing of the source machine or samples from the machine. If we can recreate or identify the same type of inconsistency or specific unique marking – with a stray mark or blemish, for example, the exact machine that created the check in question can be identified – we can verify the authenticity of your check. How could the location of a staple possibly influence a fraud investigation? You may be surprised. Often, we can determine the fraudulent insertion of a problem document with staple mark identification. By analyzing subsequent documents and reviewing the position of marks where pages have been stapled, unstapled, and then stapled again, we may be able to identify an inconsistency in the staple holes and a symptom of alteration from the original sequence of documents. If a questionable document was produced using a typewriter, we can often go in and determine which typewriter was used. Typewriter comparison and identification can either identify the manufacturer of the typewriter by examination of the type style and character spacings or, if the questioned typewriter has defects in the typeface or mechanical operation, these “unique” defects can be used as clues to possibly identify the exact machine that produced the document in question. Take for example the case of Rathergate, which we recently discussed on our blog. Knowing how a document was produced can make a world of difference in a variety of situations. Many times, a document is said to be created on a given date, but soon after, that origination date may come into question. By using document age analysis, we can analyze individual parts of the document to determine its true age. Sometimes we can identify watermarks, typesetting styles or specific character production methods to not only pinpoint the method by which a document was made, but also the original creation date of a work, helping to verify or invalidate claims as to its authenticity. These are just a few of the many services we provide here at Drexler Document Lab. 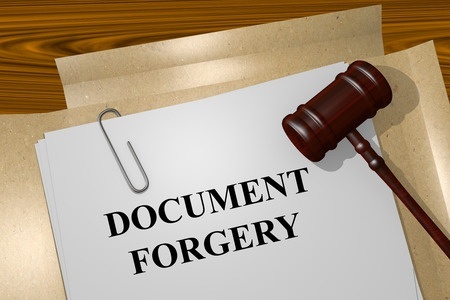 If you have a suspicious document or suspect a forgery, our expertise can help you uncover the truth. Give us a call at 205-685-9985 to discuss your document issues and schedule a consultation today.